Cheerleading FAILs come in all forms. Here are the most brutal cheerleader falls, cheerleader pyramid fails, and accidents. However, these are some of the most brutal, disgusting, and all around painful injuries to happen to cheerleaders. Watch as beautiful professional cheerleaders, competing cheerleaders, and amateur cheerleaders suffer injuries usually reserved for the people they're cheering for. Some of these will make you stomach turn, so prepare yourself for broken bones, face kicks, and good old violent sports entertainment. If you're into this kind of stuff make sure to check out 18 Superbowl FAILS and Hottest NFL Wives. This one is just downright brutal. It only takes a few seconds, but the action begins about :13 seconds into the video. How can you not hear forty 200+ pound guys coming? It’s almost like the running of the bulls, except this girl is running towards the bulls. Now this looks painful, really, really painful. 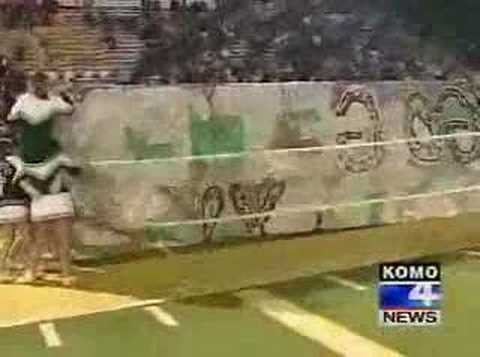 At about :38 seconds you will see a young girl going about her warmups as usual, and then BAM. Make sure to watch her left leg as she tries to stick the landing. Now this gets right to the point, and it doesn’t look like the point felt too good for the parties involved. A wood floor and a mean face plant always spell disaster. The fall is so slow; how did they not catch her? The laugh from the person recording it is pretty great too.